On Thursday evening Dave and I attended the 4th annual Elevate Akron event. Elevate Akron is an outdoor yoga festival held in Lock 3 park, the vinyasa class is free to all who attend. 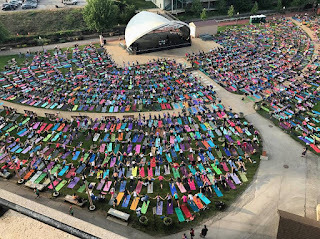 On Sunday, co-founder Tracy Rhinehart told the West Side Leader that this year the event was expected to have 2,000 attendees -- and there is space for even more growth in the future with room to hold up to 3,000 yogis. I'm sharing the photos above and directly below from the Elevate Akron Facebook page, because I think it's so important to capture the magnitude of this event. A camera can only capture a portion of the yogis, in the video from Elevate Akron I shared earlier this week, you can see everyone. In the photo below you can see where we were for the class. Dave gets off work at 4:00 and I work at the University, so it was easy for us to be downtown shortly after 4:45 to get a good spot. This photo is from when I first arrived at Lock 3.